A smart and highly engaging series, The Night Of tells the story of a young Muslim man who goes back to a young woman’s house and wakes up after a night of drugs and alcohol to find that she has been viciously murdered. He can’t remember what happened but is arrested shortly after fleeing the scene; in jail he is hardened by the system, radicalised, changes completely. Riz Ahmed gives a fine performance in the central role but the show is John Turtorro’s – the way he inhabits the opportunist but decent lawyer makes it very hard to believe the role wasn’t written for him (but it wasn’t – not only is it based on a BBC show, Criminal Justice, but it was originally developed for HBO with James Gandolfini in mind). 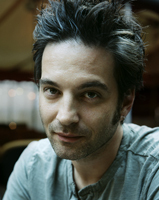 Providing the music is Jeff Russo, whose Fargo is amongst the best tv music of the last few years. The Night Of is very different, but also of high quality. The main title piece, for string quartet, is driving and dynamic yet filled with sadness – it’s clever. As a bonus, the album features an extended, fully orchestrated version near the end where the piece takes on a slightly new character – a little grander – but maintains the same emotional richness. Speaking of emotional richness, much of the score’s most effective passages come when Russo scores for small ensemble, a handful of strings plus maybe a harp and piano. Early on “Subtle Beast” sets the scene very nicely – it’s dark, far from easy listening, but entirely melodic and really rather captivating. Then comes “Andrea’s Cat” (the cat in question turning out to be one of the show’s notable characters thanks to its interactions with Turturro’s character) which is full of such sadness before finally a little warmth (and a tiny bit of black comedy) reveals itself in “Crisco & Cellophane”. “21st Precinct” (whose detective, played by Bill Camp, looks a bit like I imagine Hans Zimmer would do if he fell on hard times) is sparse, full of Thomas Newman-type atmospherics, and these go on to dominate much of the central section of the score. Moody winds and keyboards create much tension, strings undulate like a somnambulant drifter – the music’s a fierce and unwavering evocation of isolation and loneliness. The more overtly dramatic cues inevitably provide the most easily-realised interest on album – there’s something macabre about “Cot on Fire”, contrasting brilliantly with the ironic beauty of the piano solo of the preceding “Freddy’s Intro”. “Say the Words For Me” is beautifully odd, classical violin solo with Mozart-like piano and choral bursts which is unexpected and delightful. “Dr Katz” gets a quirky percussion-based sound including what sounds like struck pots and pans – it’s surprisingly captivating. I love “The Waving Cat”, full of such character. There’s no great emotional catharsis as the score draws to a close. “Naz’s Testimony” is strong on emotion, but that emotion is sad desperation; “Tattoo” features incredibly strained strings, playing as a lament; “The Call of the Wild” perhaps comes closest, building from the isolation of the opening piano music through shimmering strings to finally something of a release, but it’s not a happy one (this is not a show that neatly closes circles). The Night Of is generally much subtler music than Russo’s Fargo. It doesn’t leap out of the show in the way that score does, instead swirling around underneath it. That said – it still creates an impression. It is by necessity very dark, but the composer manages to inject so many quirks that it’s always interesting to listen to: there’s always something going on. I know I’ve mentioned sadness several times and that’s the defining feeling, but there is also beauty to be found here. There are no grand gestures – this is a score all about little movements, texture and colour. I think Jeff Russo’s one of the most interesting tv composers around and this is another strong work. Any hope of you reviewing the soundtrack for S6 of Game of Thrones? I know both the music and Ramin Djawadi aren’t among your preferences, but I think the composer really outdid himself with that one. Keep up the great work! I love the site, and reading your opinions on film scores. You have quite a lot of insight! Doubtful, to be honest. I don’t have the album.